It’s such a great question, and there are many layers to my answer. Big picture answer: My favorite thing to invest in is my education. The detailed answer: A great Bible verse (Proverbs 29:18) shares “where there is no vision, the people perish.” My education has helped give me vision! By ensuring my education continues every single day, my vision expands regularly. Even more specifically, I love to invest in money education. I discovered back when I was living the “I Was Broke” part of my life that the biggest reason I was not prospering like I could was because of my lack of financial knowledge. I knew the most basic financial principles such as “save money for a rainy day” (I didn’t), “invest long-term for retirement” (I actually did that), and “it’s important to prepare a monthly budget and live by it” (I didn’t do either). At age 28, I began investing in my money education. It changed my life forever. It changed my family’s life forever. Let me explain some of my financial education investments. Books When I was broke, I bought a book about personal finances. Then I bought another one. Overall, I have purchased and read at least 50 books about personal finances. Let’s say they cost an average of $20 each. This is a total investment of $1,000. The rate of return has been WAY MORE than 10,00o%. Seminars & Membership Programs I’ve went to events where they have taught about money. Some of them have been quite alarming in their approach to money and were definitely high pressure events attempting to get me to “buy their special item today only,” but every one of them has provided an opportunity to expand my money knowledge. I’ve spent somewhere around $1,000 to attend these events. The rate of return has been WAY MORE than 10,000%. Actual investments I’ve bought 4 houses, dozens of land properties, and hundreds of stocks and mutual funds. I’ve successfully started a business from scratch and purchased another one. We have a total of 21 team members working with us to help people accomplish far more than they ever thought possible. There is NOTHING like actually putting the knowledge into practice to expand vision. The rate of return on these investments has been extremely blessed, and it would have been impossible without the investments I’ve made in obtaining financial knowledge. SHARE YOUR STORY: When was the last time you invested in YOUR money education? What did you invest in? 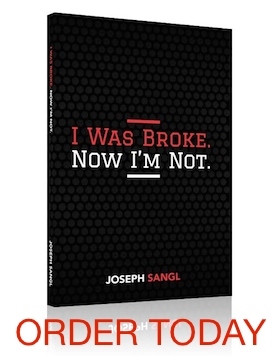 I’ve written each of my financial books to help expand money education. You can purchase copies HERE. Books, podcasts, blogs, conferences, and resources are out there. Most do not cost that much either. Many of them can be fun things to do as well — we went out of state to the Generosity Learning Experience (as an example) and left the kids with the grandparents. Always a good time for everyone! Joe, I haven’t been to the blog in a while. But this post is FIRING ME UP!! Thank you for reminding me to keep pouring gas into the tank. Now that I’ve come off of vacation it’s time to hit the accelerator again!